BRITTLE is a traditional holiday treat that boasts ancient origins. Its consumption has always been associated with the winter season, the warmth of the Christmas holidays and the smell of cotton candy, caramelized almonds and dried fruit. These are all sweets that we still enjoy today,when we walk through the stalls of village festivals and markets. 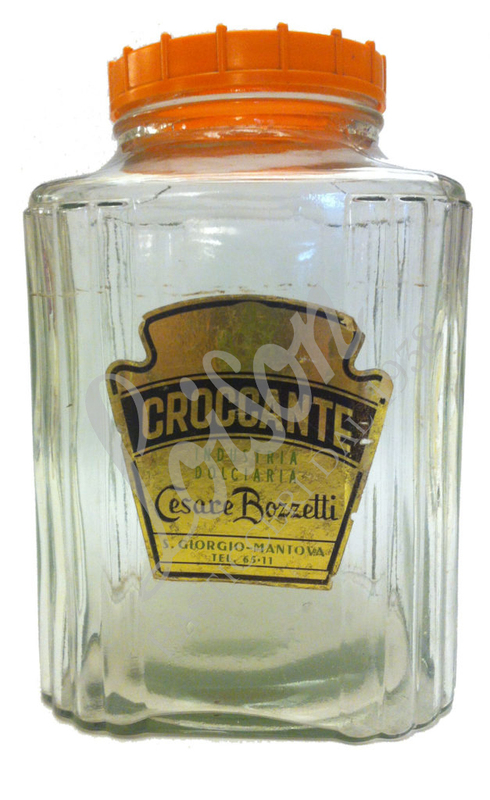 This glass container by Cesare Bozzetti is the last relic added to our Museum’s collections and a true testament to the origins of an artisan company. In the 1950s, back when Alessandro Loison was attempting his first confectionery experiments, fragrant bars of brittle were being baked in the small workshop in Motta. They were sold at Christmas time, along with caramels, meringues and a few other regional cookies, such as zaletti and pevarini. In those years, Alessandro Loison decided to broaden his horizons and began a new business adventure. It was Cesare Bozzetti himself, an old family friend and owner of a small confectionery factory in S. Giorgio, Mantua, who gave Alessandro his first professional tips. The Bozzetti company closed shortly after the passing of its owner, at the end of the seventies. In addition to brittle, advertised here, they also produced croissants, pastries and snacks that were also sold by Loison in the Vicenza area. The recipe for this simple dessert was taken from the book “La scienza in cucina e l’arte di mangiar bene” (Science in the Kitchen and the Art of Eating Well) by celebrated gastronomist Pellegrino Artusi. Peel the almonds, split thenut and cut each half into slivers, either lengthwise or crosswise, as you prefer. Place these cut almonds over the heat to dry until they turn golden: do not toast them. Meanwhile, place the sugar in a saucepan set over the heat and, when the sugar has completely liquefied, add the hot almonds to it and mix well. At this point, you will want to throw a scoop of asheson the coals, so the brittle does not take on a bitter flavor. The brittle will continue cooking and eventually take on the amber color of cinnamon. Pour it a little at a time into a mold of any shape, previously greased with butter or oil, and press it down against all sidesusing a half lemon. Spread the brittle out as thin as possible. When completely cooled, remove it from the mold. If necessary, dip the mold in boiling water to help release the brittle. The almonds may also be dried out in the sun and finely chopped with a mezzaluna (mincing-knife). Add a piece of butter when it is time to mix them with the powdered sugar.